Although we hear it may be coming this weekend, we haven’t had a winter in Penn’s Valley this year. We had one snowstorm where a foot fell and then it melted in a week, and another with only a few inches. For the most part we’ve had lots of rain. This year was a record year in Pennsylvania for rain and because of it Penns Creek has been high off-and-on since spring. We’ve been able to fish it some days. It’s been high and muddy on others. The key to success has been targeting those days when the creek is dropping into fishable levels. As soon as it loses its muddy tint the fish turn on. 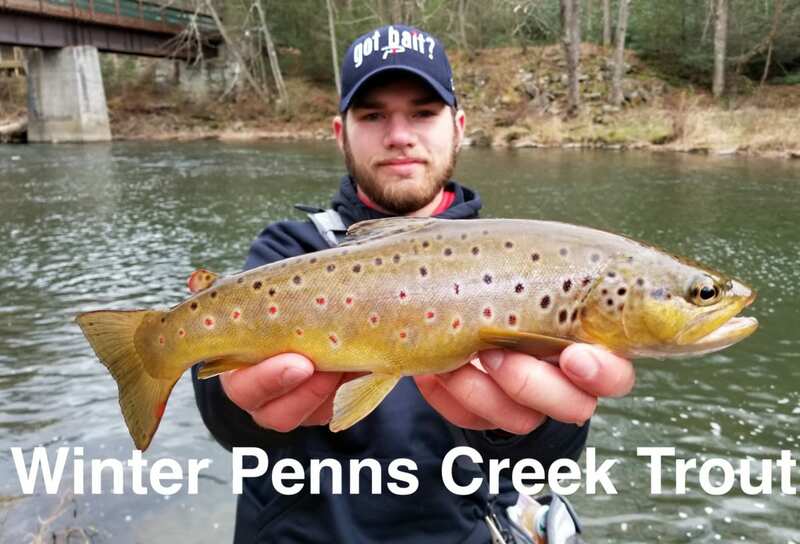 Around here we call it the “Penns Creek Green.” This is when the water retreats from being chocolate brown and turbulent and transforms to a greenish color. When this happens the larger brown trout become active. When most anglers are waiting for the water to recede further we are catching our largest brown trout. 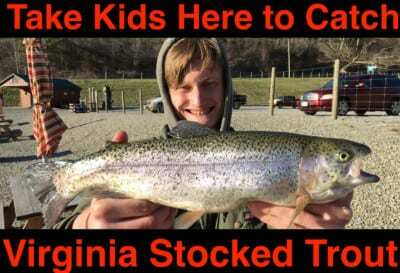 Fish plants ended in April in the stocked portion of Penns. However, fishing hasn’t slowed since. While pressure has diminished since spring the bite hasn’t backed off. In fact, we hooked up on large brown trout and rainbows all last year and continue to do so early this year. We are even seeing a few golden rainbows still. 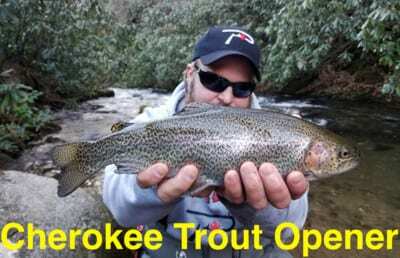 Depending on what section of the creek we target, rainbows and browns are always available. 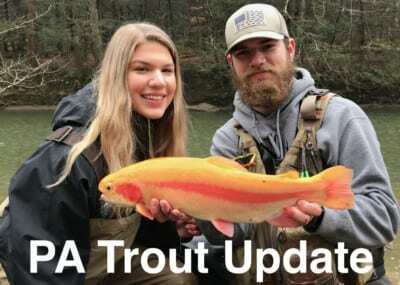 Most of the trout are averaging 14-18 inches, but we’ve caught them up to 26 inches in recent weeks. We’ve been targeting trout two ways. Success has continually come on bait under a bobber and casting stickbaits. When using bait we’re drifting Chartreuse Garlic Fire Balls, Natural Deluxe and Gold Label salmon eggs under a small float. Even when the water is muddy I prefer to use six-pound Stren Low Vis Green. The key has been drifting the eggs in pockets. Anytime you find a large rock in the middle of the creek there’s always going to be a fish behind it. Same thing with fallen trees. Lures have also worked well. I’ve been casting Chasing Trophy Fish jerkbaits coated in Atlas Mike’s Trout Lunker Lotion and more of the larger fish are coming on lures. What’s been interesting is the larger browns are being caught on lures and the biggest rainbows are eating the bait. I’m anticipating this pattern will remain throughout the winter months. Even if we start to see snow, like we are accustomed to, bait and lures will continue to work like it always does. 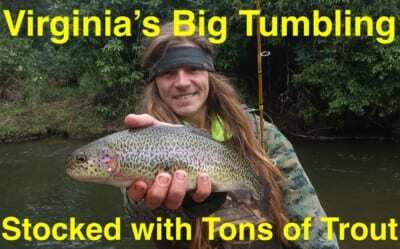 The best thing about Penns this time of year is that there are many miles of water to fish, hardly any anglers out and plenty of big fish biting. Editor’s Note: Isaac Zettle operates Trophy Chasers Outdoors. To follow their adventures please visit https://www.facebook.com/TrophyChasersOutdoors.